This website recently migrated to a new server. and there are remains much to do in The Upstairs Train pages (my layout). If you find any other broken links or other errors, please email me at theupstairstrain@yahoo.com. This website began as a place to display my collection, both for fun and for insurance purposes. As I built it, however, a new vision emerged, that of a reference tool for the American Flyer community, "The Gilbert Gallery" if you will. 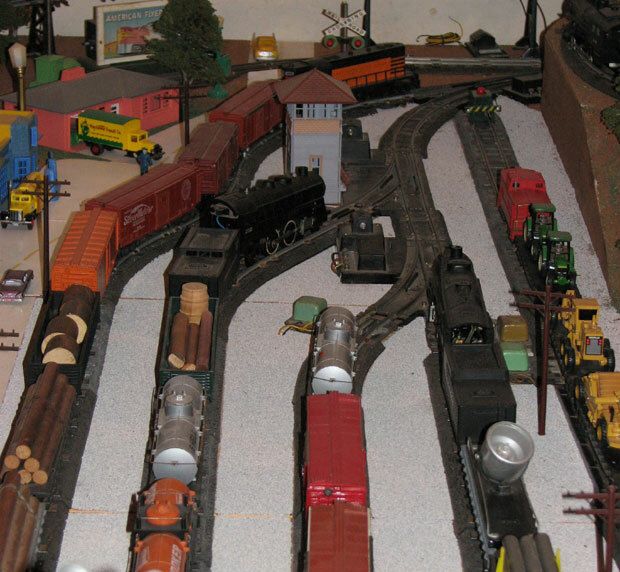 At that point, late in 2005, my collection provided a pretty representative sampling of the rolling stock made by American Flyer over the years, and I decided to go the rest of the way and collect pictures of the cars and engines that I didn't have in my collection. At this point, the site lists all of the S-Scale American Flyer products produced by The A. C. Gilbert Company from 1946 to its demise in 1967, and by Lionel since 1979. It provides individual pictures of almost all of the engines, freight cars, passenger cars, and accessories, including some very rare ones, though I don't yet have pictures of all the significant variations of each item. I am in the process of collecting pictures of freight and passenger sets and adding them to the gallery. This gallery will continue to grow and become more comprehensive as I collect more equipment and as visitors send me pictures of items I don't yet have. If you have a car, engine, accessory, or set that you would like to share with the world, email me a picture: theupstairstrain@yahoo.com. Click here for a list of the pictures I need to complete the Gallery. Click the picture to see the gallery of Gilbert's engines. Click the picture to see the gallery of Gilbert's passenger cars and sets. 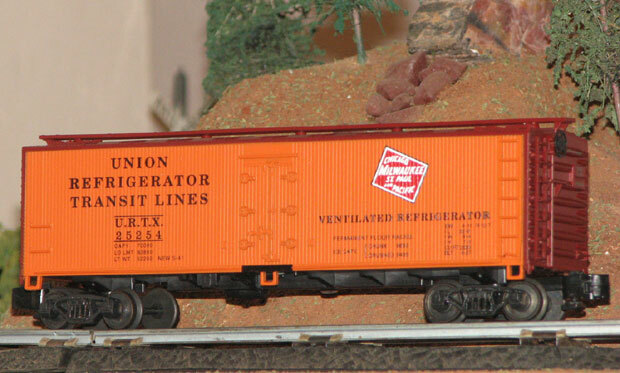 The passenger cars naturally fall into coherent sets based on their common design and/or railroad names, but that's not true of Gilbert's freight cars. As on the real railroads, the typical American Flyer freight train contains cars from a variety of railroads around the country. For that reason, I never paid much attention to Gilbert's sets until just recently when I discovered by accident that I had collected enough freight cars to assemble the K5358W Challenger set. That got me started and I began putting together and photographing all the sets I can with my cars and engines. 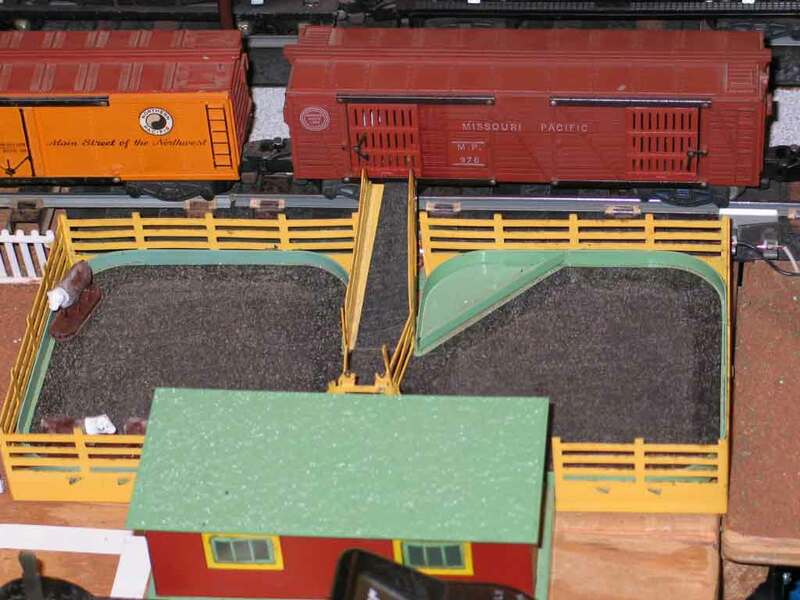 Click the picture above to see the gallery of Gilbert's freight cars and sets. 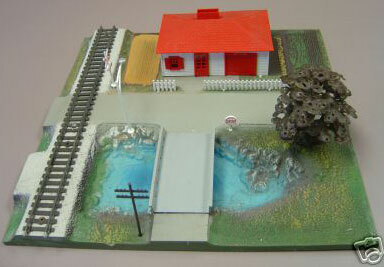 The last of the sets that Gilbert made were the All Aboard Scenic Panel sets. Made in 1965 & 1966, these were pre-landscaped modular panels with Pike Master track already laid and everything prewired. The straight-track panel on the left is #26121 and the curve on the right is #26101. There was also a straight-track panel with a whistle (#26122), a crossover panel (#26151), a right switch panel (#26141, and left hand switch panel (#26142). The panels could be assembled in a myriad of ways, limited only by your imagination and the number of panels you had. Each panel came with "Accessories," buildings, bridges, hills, a tunnel, trees, signs, telephone poles, street lights, and fences, that you could put anywhere that had appropriate landscaping and peg holes. For Christmas of 1966, they made a special series of panels and #20814 Winter Wonderland set with snow rather than grass. 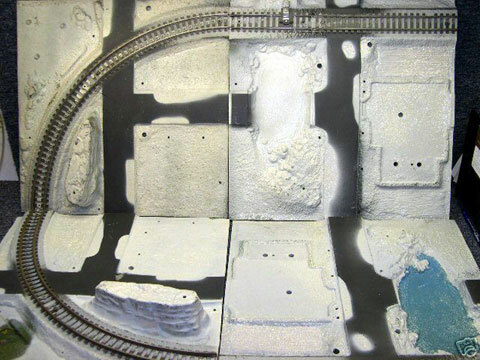 They were the same panels oversprayed with white paint and sparkles to simulate snow. Because of limited production, these are now extremely rare and valuable. While I was researching the All Aboard sets, I discovered "The Unofficial home of the All Aboard Scenic Panel Train Sets". 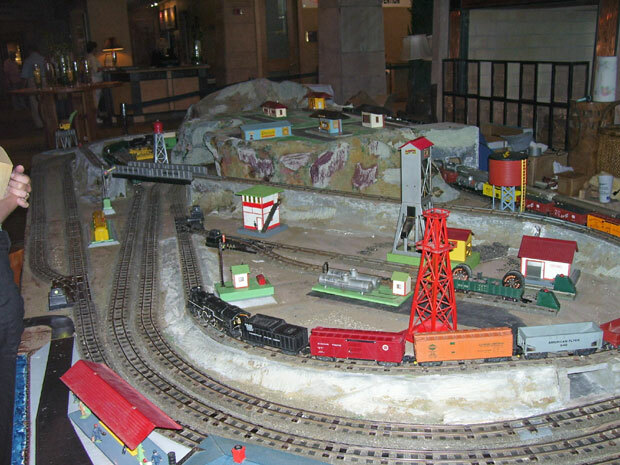 It is a terrific site that explains the concept, tells the history, shows pictures, and links to the All Aboard Sets Club. It even includes the catalogs and instruction manual. There is no sense in my duplicating what they have done so well. Speaking of sets, perhaps the grandest were the Dealer Displays. I will build a page of them as people send me pictures. Classification of the various kinds of American Flyer accessories isn't at all straightforward. No two of my books use the same classification scheme. So I feel free to make up one that makes sense to me. I hope you like it! Personally, I like to distinguish Accessories from Infrastructure. Other than the fact that some of the Operating Accessories are buildings or towers, these categories are pretty self-explanatory. Operating buildings and towers are listed in both places. Click the picture to see the overview gallery of Accessories. Click the picture to see the overview gallery of Infrastructure Accessories. These categories are pretty self-explanatory, too, but not perfect either. For example, the TM Guide calls the #26810 Pow-R-Clips an Electrical Accessory, but the various Track Terminals that serve the identical function are called Track Accessories. I deviate from TM by listing the Pow-R-Clips as a Track Accessory. In The Gilbert Gallery, Track Accessories either are mounted on the track or connect track (i.e., track locks). Electrical Accessories are whistle and horn controllers, the Lockout Eliminator, wire, rectifiers, circuit breakers, and the like. The Reverse Loop Relay and Kit defy definition and are listed both places. 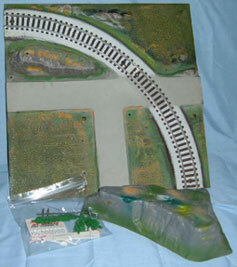 Accessories that are integral with track (e.g., track pins and rerailers) are listed with Track & Switches. 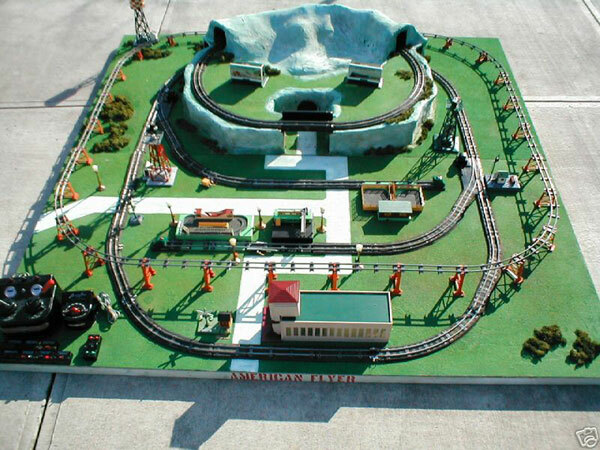 The TM Guide lists Track Ballast in Track Accessories, but I list it in Landscape Accessories. Semaphores, gates, and crossing signals are Operating Accessories. Track cleaning fluid is included among Supplies. Over the years, Gilbert made four different kinds of couplers, three of which are common and familiar to most American Flyer owners: link, knuckle, and Pike Master. The fourth, the so-called "solid knuckle coupler," was short-lived and not used on very many cars. Lionel later came up with its own version of knuckle coupler. American Flyer has therefore gone through five generations of couplers. Because there seem to be a lot of people confused by this, I created a page to show the differences. Click the picture below for more detail. In the past couple of years, I have acquired some Gilbert-Compatible S-Gauge engines and cars made by three so-called "Modern S" manufacturers: American Models, Crown Models, Putt Trains, and S-Helper Service. The detail and precision scaling of the equipment made by these manufacturers really are far superior to anything that Gilbert or Lionel ever made. But they're also a lot more delicate. 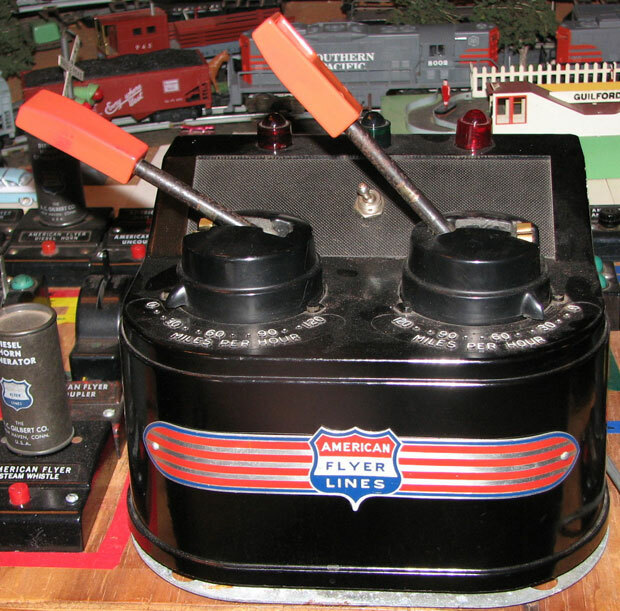 The Gilbert cars, and most of the Lionel Flyer cars, were designed as toys to be played with by young boys. Cars from the three "Modern S" manufacturers clearly are not. American Models and S-Helper Service sell their equipment with a choice of either Gilbert-Compatible ("Hi-Rail") wheels and couplers, or scale wheels and couplers (which are much smaller and will not connect to American Flyer engines and cars). Crown Models is no longer in business, but the cars they offered cars with either Hi-Rail wheels and couplers (mostly made by S-Helper Service) or scale wheels and no couplers. This is my first train from S-Helper Service, my Western Pacific Freight. Click here to see my second S-Helper train, my Chessie Freight. Stay tuned: I am starting to build an S-Helper gallery. At this point, the only page is the SW-1 diesel switch engines. My first Crown Models car, the #25254 CM&StP Reefer made for the 25th Fall S-Fest. Click here to see my gallery of the complete Crown Models product line. My first American Models hopper, Union Pacific 3-bay model 3313. Stay tuned: I plan to build an American Models gallery some time in the future. 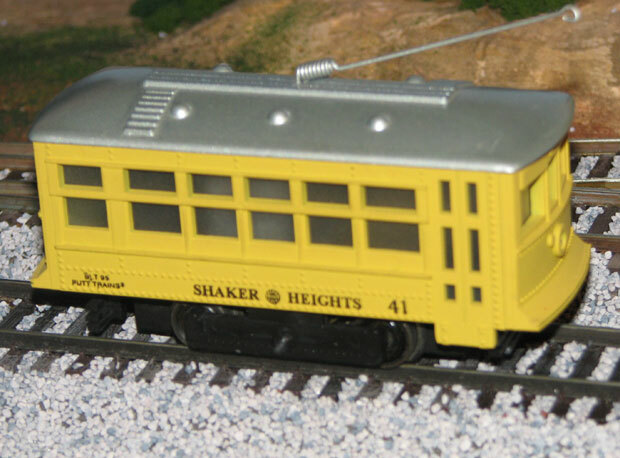 #41 Shaker Heights trolley car from Putt Trains. but has gone out of business and no longer has a presence on the web. if people coulld send me pictures and identifying information. For some reason. I can't get the button html to work.